Alison Elko Franklin is a senior managing associate with Denton’s in Atlanta, focusing her practice on corporate reorganizations, municipal reform, creditors’ rights litigation, and distressed transactions. She represents debtors, trustees, creditors’ committees, and creditors in Chapter 11 reorganizations, Chapter 9 municipal debt adjustments, Chapter 15 cross-border insolvency proceedings, and Chapter 7 liquidations. Franklin also counsels examiners, receivers, and creditors in fraud investigations and commercial litigation in federal and state courts, and represents purchasers in 363 sales and various parties in problem loan workouts, forbearance agreements, and other distressed transactions. She is involved in a number of pro bono programs and projects and serves as vice chair of the TMA Atlanta Chapter. Q: How did you gravitate into turnaround and restructuring work? Or did you start out headed in that direction? FRANKLIN: Not exactly. I came from a family of educators and was unfamiliar with law. I first became interested in law in high school when I was involved in an accident. I had paid admission to play on a volleyball court on the beach the first weekend it was open for the season. While playing, I dove for a ball, landed on a piece of metal, and severely lacerated my leg. I injured my knee, was hospitalized, and had several surgeries. The experience was traumatic for me as a student athlete who had dreamed of playing sports in college. I hired a lawyer, filed a lawsuit against the owners of the volleyball court, and spent four years litigating the case. I helped my attorney respond to discovery requests, was deposed, underwent an examination by the defendant’s doctor, and even participated in a court-ordered mediation. We wound up settling the day before trial, and in the end, I thought my lawyer empowered me; he was my advocate and fought for justice in my case. He helped me achieve closure and move forward with my life. I even used a portion of the settlement to pay for law school. It was that experience as a client that inspired me to become an attorney. I developed my passion for bankruptcy litigation when I was a student at the Emory University School of Law. There, I took several bankruptcy courses, including a class taught by Ralph Brubaker, who was a wonderful professor. I was also an editor and the business manager of the Emory Bankruptcy Developments Journal. Then I interned with the U.S. Bankruptcy Court for the Northern District of Georgia and the Office of the United States Trustees for Region 21 in Atlanta. During my internship, I was inspired to practice bankruptcy law by my mentor, the Hon. C. Ray Mullins, chief judge of the Bankruptcy Court. While working on his cases, I realized that bankruptcy litigators are among the last general practitioners handling interesting issues and touching on a variety of practice areas, such as labor and employment, mergers and acquisitions, real estate, environmental law, and even tax—not my favorite area. I also learned that honest but unfortunate debtors suffering from financial distress can receive a fresh start from burdensome debt. I observed troubled businesses repaying creditors and restructuring their finances so they could emerge from bankruptcy as viable enterprises. I was particularly interested in how corporate bankruptcy touches on many aspects of business law. I liked how it’s a hybrid between litigation and transactional practice. Q: How long have you been practicing bankruptcy law now? FRANKLIN: I’ve been practicing bankruptcy for 15 years. After graduating from law school, I clerked for Judge Mullins for two years, and then I was at another large firm in Atlanta before joining Dentons US LLP (formerly McKenna Long & Aldridge LLP) before the merger about a decade ago. Q: What have been some of your most gratifying, important, or favorite engagements along the way? FRANKLIN: I think my most significant professional achievement was the confirmation of a $100 million plan of debt adjustment that paid creditors in full in a contested Chapter 9 case of a municipality. This was a particularly challenging and novel matter that required legal, financial, and political experience, as well as transactional, litigation, and regulatory services. In fact, this was a “Chapter 18” case, two Chapter 9 cases. The first case was dismissed by the Bankruptcy Court after litigation with a creditor regarding the eligibility of the debtor to file for bankruptcy relief. While we litigated a direct appeal of that decision to the U.S. Court of Appeals for the 2nd Circuit, the client engaged in successful efforts to have the New York Legislature amend state law to specifically authorize the client to file for bankruptcy relief, the issue at the heart of the dismissal of the first case. We then dismissed the first case and filed the second case. During that case, the state Legislature again enacted new legislation, this time to authorize the client to expand its business operations. In the meantime, I worked on the plan and restructuring efforts, including modifying healthcare benefits, rejecting burdensome leases, renegotiating contracts, and evaluating and improving business operations. While guiding the restructuring, I also advised the client with respect to its financing and development of a new facility. It was this new facility that was approved by the legislature. As a result of this comprehensive solution, the client was able to successfully reorganize its financial affairs, which generated substantial revenue, enabling the full payment of claims, rather than pennies on the dollar. In addition, the new business model enabled the municipality to generate substantial revenue for creditors, employ current employees and hire additional workers, and it established a new revenue stream for the county. This was a particularly rewarding engagement, representing a municipal debtor for over four years in the first confirmed Chapter 9 plan in New York. In a more recent engagement, I represented a creditors’ committee and the liquidating trustee of what was the largest oil refinery and terminal facility in the Western Hemisphere when it was in operation. The unsecured claims in this case totaled more than $2 billion, and there were a lot of issues involving the sale of assets, the assessment of insider claims, and the resolution of hundreds of tort claims. In representing the committee, we objected to the bid procedures for the sale of substantially all of the debtor’s assets, which was primarily the refinery. Among other things, we were able to secure additional time to market the assets, consultation rights, a reduction of the breakup fee by $1 million, and the reduction of minimum overbids by $3 million, which all facilitated a more open and robust auction. The committee then objected to approval of the sale because of concerns regarding the value the estate would ultimately receive from the “successful bid,” as well as its allegations regarding collusion. After engaging in discovery on an expedited basis, we were able to reach a favorable settlement, the value of which was approximately $85 million—$30 million cash for unsecured creditors and the assumption of pension obligations valued at $55 million. The settlement also included a waiver of $1.8 billion in unsecured notes. The third gratifying engagement I worked on was the representation of a creditors’ committee of a vertically integrated, publicly owned poultry producer. When the bankruptcy was filed, it was doubtful whether the debtor would be able to operate as a going concern. We were considering the total liquidation of their assets, including euthanizing millions of chickens. But the senior secured lender eventually provided sufficient financing to fund operations while the committee worked with the debtors’ professionals to market and conduct a sale of the assets. It was an especially successful auction and resulted in a payment in full to all creditors, with interest, as well as substantial distribution to equity holders. It preserved the debtor’s business and more than 1,500 jobs. Q: I think that’s the first time I’ve ever heard anybody mention a debtor paying interest. FRANKLIN: It was an amazing result that exceeded our expectations. There were two active bidders, and that’s really all you need for a robust auction. The creditors received post-petition interest at 5 percent per annum, and equity received a significant distribution. Compared to the bleak outlook at the beginning of the case, it truly was a remarkable outcome. While these restructuring engagements have been very interesting, I want to mention that I also find my pro bono work to be quite meaningful. I have been instrumental in starting three pro bono projects that address unmet legal needs in underserved populations here in Atlanta. Most recently, I co-founded the Low-Income Creditor Assistance Project (LICAP), which provides low-income judgment creditors with assistance in bankruptcy cases. I serve as the volunteer advisor, and I have taken on several of these cases. It’s been rewarding to be able to secure substantial distributions to these individual creditors, who previously had little hope of any recovery. I also assisted with the creation of the Georgia State University College of Law Bankruptcy Assistance and Practice Program (BAPP). That provides low-income debtors with bankruptcy counsel through a team of volunteer attorneys and law students. Finally, I co-founded the Reaffirmation Project, which advises unrepresented debtors entering into reaffirmation agreements in bankruptcy cases. In addition to these pro bono projects, most recently I’ve been working on the expansion of the Modest Needs program, which is sponsored by the Atlanta Bar Association Lawyer Referral and Information Services program. This public service program is designed to assist Georgia residents who are not financially eligible for legal aid but don’t have the resources to retain a private attorney at the standard market rate. While engaged in pro bono work, I realized there was a tremendous need for discounted legal services due to gaps left by traditional legal aid organizations. This program ensures that those with limited incomes have access to legal assistance. Q: How long have you been involved with those programs? FRANKLIN: The Reaffirmation Project started in 2007. I started working on BAPP in 2012, and it launched in 2013. I also began working on LICAP in 2013 because we had pro bono projects and resources program for debtors but not for creditors. My work on the Modest Means Program started in 2016, and we officially received approval to expand the program in 2018. I’m currently soliciting new attorneys for the bankruptcy panel and working to promote the program. FRANKLIN: There are three key milestones that helped make me the professional that I am today. The first was my bankruptcy court clerkship, which was a valuable experience that contributed to my success in my career thus far. During my two years as a clerk for Judge Mullins, I developed an understanding for the role of the bankruptcy judge and an appreciation for providing access to justice for all who seek it. Judge Mullins retired about a year ago. When he was on the bench, he was always fair, impartial, very empathetic, and exceedingly respectful when presiding over matters of significant importance to both pro se individuals and large corporations alike. I benefited from Judge Mullins’ experience and expertise as we collaborated in a small team, exchanging ideas and navigating challenging legal issues. I assisted him in his decision making by reviewing briefs, hearing arguments, analyzing different facts, researching legal issues, making recommendations, and helping him draft opinions. In addition to gaining invaluable insight into the reasoning and thought process that goes into judicial decisions, I also had the unique opportunity to shape the law, particularly in two significant cases in our jurisdiction. In working with Judge Mullins on these decisions, I not only gained substantive knowledge of bankruptcy law but I also developed a deeper understanding of professionalism, ethics, and justice. Judge Mullins always endeavored to ensure that all who appeared before him were treated with respect and received a fair hearing. He really inspired me to further the cause of justice. The second milestone has been my chairing of several bankruptcy professional organizations. Most recently, I was chair of the board of directors of the Bankruptcy Section of the Atlanta Bar Association, after having served on the board for six years. During my one-year term, I presided over seven CLEs and numerous social events that were well-received by the membership. I also helped manage six pro bono projects led by eight coordinators, with nearly 100 attorney volunteers assisting more than 600 individuals. Under my leadership, the board received three awards from the Atlanta Bar Association: the Community Service Award, the Pro Bono Award, and the Small Section of the Year Award. In addition to my extensive involvement in the Bankruptcy Section, I’m active both internationally and locally in the International Women’s Insolvency and Restructuring Confederation (IWIRC), which is devoted to the connection, promotion, and success of women in the restructuring industry. I served as a director at large and the vice director of programs on the international board. I have also served on the board of the Georgia Network for over a decade. I was co-chair when the Georgia Network received the Ryan Award as the most outstanding IWIRC Network and was selected to host the Leadership Summit for the IWIRC international board and network chairs in Atlanta. Finally, I serve as a leader in TMA. I am a former chair and a founding board member of the TMA Atlanta Chapter’s NextGen Program. I also served on the Global Executive Committee of the NextGen program, and I’ve been active with the TMA Global Network of Women. I’ve served as a board member of the TMA Atlanta Chapter for more than seven years. I’m currently vice chair of the chapter, and in 2020, I will be the first woman and the youngest person to chair our chapter. I’m really excited and humbled by the opportunity. And the last milestone I wanted to mention is the birth of my children. I think becoming a mom has really helped me be a better lawyer. A mom is the ultimate multitasker, and I’ve really refined my abilities to prioritize and juggle multiple matters. I’m also more focused and purposeful. I’m really motivated to get work done effectively and efficiently. And most importantly, I’m more inspired to be a role model to my children, especially my daughter. I want her to know she can accomplish anything, and she inspires me to push myself to reach my goals, particularly in my career. FRANKLIN: Through TMA, I have really expanded my network to include a wide range of professionals with diverse backgrounds in Atlanta and internationally. TMA has not only afforded me the opportunity to establish connections with various players in the industry but also to develop many personal relationships. I’m very grateful for all of the mentoring, support, and referrals that I’ve received from my TMA family. I have also enjoyed the continuing education seminars, and the conferences that I’ve attended, particularly the TMA NextGen Leadership Conference. And I’ve found the Journal of Corporate Renewal to be a really valuable resource for my practice. Locally, I value the programs that we offer here through the Atlanta Chapter. Every year I help plan an annual TMA and IWIRC judge’s panel, and I’m currently planning this event for March. We invite judges from various Bankruptcy Courts across the country to Atlanta to share their perspectives from the bench, and this event’s been very popular with our members. I’m thankful for the opportunity to organize and co-host this special program with IWIRC. All in all, I’ve really developed a deeper appreciation of TMA and my fellow members on both the local and global levels. FRANKLIN: I have several passions outside the office. First and foremost is my family. I have a 4-year-old daughter, a 15-month-old son, and a wonderful and supportive husband who is a litigator at a large firm. I love spending time with my family. I also really enjoy running. I used to run marathons; now I mainly run after my kids. I run 5Ks or occasionally 10Ks. In Atlanta, we have the Peachtree Road Race, which is the largest 10K in the world—it’s a July 4 tradition. I’ve participated in that pretty much every year since 2004, including the year when I was eight months pregnant with my daughter. 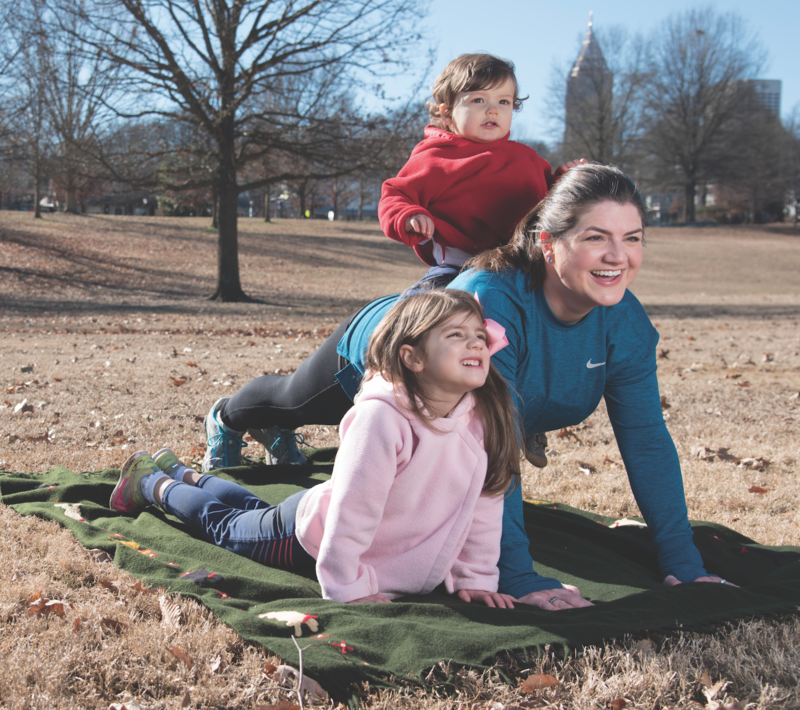 I still participate every year—except when I was pregnant with my 10-pound son—and I run a lot with the kids. My daughter’s kind of taken to it. I don’t run very fast with them, but to keep up with me, she generally rides her bike or uses her scooter and I push my son in a jogging stroller. When I’m not able to run, I spend time on my Peloton, or I bike with my family. We have a couple of bikes with child bike seats on the back. That’s been a great family activity, especially when we get to travel. I’m also a huge South Carolina Gamecock and Georgia Tech Yellow Jackets fan. I’m an avid sports fan generally, but I’m very passionate about those two teams. The University of South Carolina is my alma mater. I’m not often able to make the trip to Columbia, particularly for football games, but we have family season tickets to the Georgia Tech football and basketball games. The ACC (Atlantic Coast Conference) is a little bit of a different experience than the SEC (Southeastern Conference), but my kids really do enjoy attending those sporting events, even at their young age. Q: What might people who only know you professionally be most surprised to learn about you? FRANKLIN: There are probably two things that people who know me professionally would be surprised to learn. The first is that I love photography. I won a few photo contests back in the day when I had free time. I took several photography classes, and I used to develop my own photos from film before digital cameras came along. I even dabbled in photography for a magazine when I was in college. One of my favorite vacations before kids was going on safari in South Africa and taking photos as if I worked for National Geographic. I think people would also be surprised to know that my husband and I enjoy collecting folk art and antiques. We frequent art galleries, antique shows, estate sales, and auctions, both in person and online. Our tastes are somewhat eclectic, so for folk art I like Cornbread, Sarah Rakes, and southern pottery, particularly an artist named Lanier Meaders. Our antiques include everything from a Dutch server with olivewood inlay from the late 1600s to a Chinese ebonized cabinet that dates back to the late 1800s to a Victorian papier-mache table with a mother of pearl inlay that no one can place anything on because water will dissolve it. We have to protect it from the kids. But I think my favorite piece—the kids actually love too—is a French comtoise clock, which is a form of a provincial weight-driven clock. It has a painted pine case and an embossed brass pendulum. The pendulum has a horse drawn cart with a farmer in it, and the horse’s head and the farmer’s prod for the horse move as the pendulum swings. My husband and I have had some great finds in folk art auctions, local antique shows, and markets. I would say our best purchase was a Turkish rug that we bought for $400 at an antique sale in our neighborhood that has been valued at more than $8,000, so we are very excited about that purchase. Right now, we focus on buying pieces that we both like to decorate our home, but it’s definitely a bonus if we’ve made a good investment. Q: You bet. Those kids are going to have to go to college someday. Is there anything you would like to add? FRANKLIN: The only thing that I would add is that I encourage young professionals or those new to the industry to become involved in TMA. It has been invaluable to my career. If you are an active participant, you can really take advantage of all the benefits of membership and opportunities for your professional development.